Just in time for Valentine’s Day – buy your sinister sweetie a unique gift this year – “Till Death: A Guide to Love and Loss” is a brand new, 70-page, full color hardcover photo book that combines the creative and twisted minds of world renowned rock photographerJEREMY SAFFER and the to-die-for front woman of New Years Day, Ash Costello, in a goth culture romantic horror-comedy with an axe-sharp sense of humor. Our victim is portrayed by Kriz DK of the Genitorturers and Deadstar Assembly. *Pre-orders are set to start shipping the week of March 18th. Till Death… shows the trials and tribulations of a boy as he tries to win the heart of the girl of his dreams (or nightmares). His misadventures hilariously lead him to torture, beatings, loss of vital internal organs, and worse…all in the name of love. Follow Ash Costello as she (literally) catches the eye and captures the heart of an innocent boy in love! The book is a 70 page, 8.5 x 5.5 full color hardcover book with over 50 full page images. ALL Pre-orders come with one of three anti-Valentine’s Day greeting cards made from the images and words of Till Death… (chosen at random). 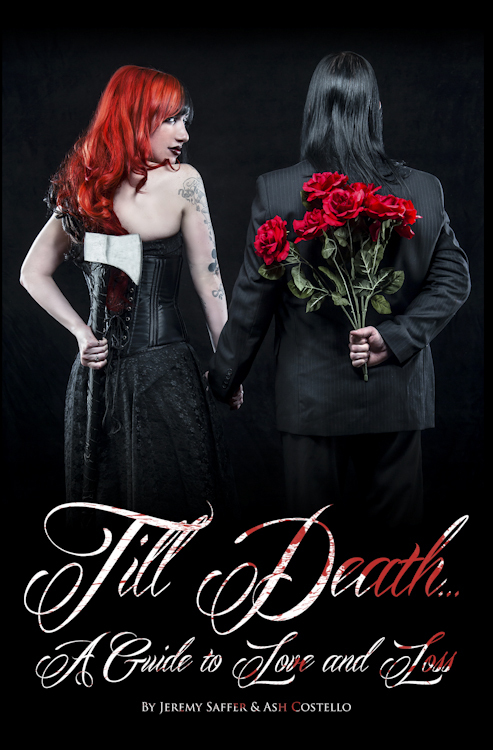 – A hand numbered and signed copy of Till Death… signed by both Ash Costello and JEREMY SAFFER. For more information and to buy the book, please visit http://jeremysaffer.com/tilldeath/. This entry was posted in Artist, Bassists, Blues, Classic Metal, Classic Rock, Drummer, Glam, Guitarists, Heavy metal, Internet Radio, Metal, Music, Outlaw Metal, Rock, Rock N' Roll, RockStar, Sleaze, Surrealist, Tattoos, Thrash Metal, Whiskey Metal, Wornstar Clothing and tagged 80's, Ash Costello, “Till Death: A Guide to Love and Loss”, Bleach Bang, Bleach Bangs, Bleach Bangs Radio, Charlie Owens, Classic Rock, Deadstar Assembly, Genitorturers, Glam, Glam Rock, Hard Rock, Heavy Metal, Jeremy Saffer, Kriz DK, Metal, Music, New Years Day, Randy Norris, Rock, Rock N' Roll, Rock Star, RockStar, the Hellion, the Hellion Rocks. Bookmark the permalink.